Lance Roux is a Principal Consultant at SafetyPro Resources, a company that’s headquartered in Baton Rouge, Louisiana. His professional safety career began in 1996 in the petrochemical industry and has expanded his experience in project safety management, compliance auditing, risk assessment, and program development for an array of industrial markets including: oil and gas (upstream and downstream), healthcare, chemical processing, refineries, power (nuclear, hydro, and fossil fuel), and shipyards. 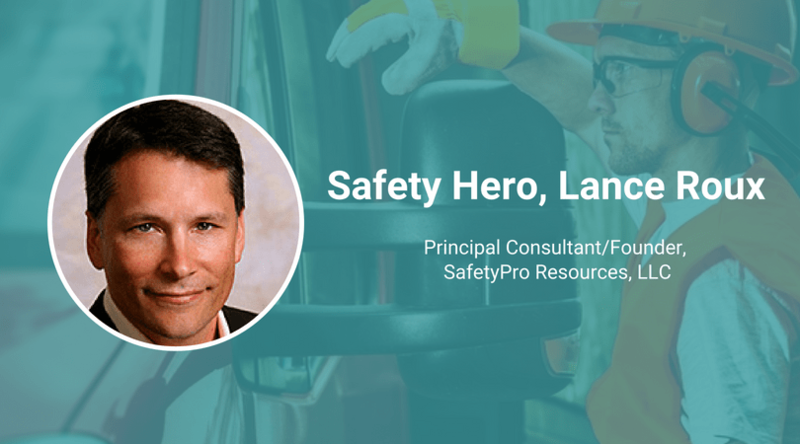 Keep reading to see how this Safety Hero currently approaches his work, and to see what he describes as “the thing that everyone should know about safety” even if that may be hard to admit. I was introduced to the field of safety through my father, who was a safety professional for a major heavy industrial contractor in Baton Rouge. While attending Southeastern Louisiana University, I changed my major from Industrial Technology, to Occupational Safety, Health, and Environment. Upon graduation, I went to work for a contractor in Baton Rouge for several years before ending up working at a small safety and environmental confirming firm. After a few years at that firm, I started my own safety practice in 2005 – SafetyPro Resources. In my current role as the head of a small organization of safety professionals, I think the key thing to being effective is for me to just get out of their way so that they can do what they do best. I’ve never liked strictly controlled environments or org charts. So that’s contributed to my style of management – which is to manage less and empower more. We look for smart and resilient self-starters who can totally manage their own work. Expectations are set early on, and we have a great web-based tool for monitoring all of our projects We don’t do annual appraisals, but instead do quarterly “check ins” to make sure that our values are aligned and they are progressing professionally to both our satisfactions. So my job is really just to ensure that our people have everything they need to be successful, offer help if there are bottlenecks, and then step back. What’s your advice for someone starting out in a role that supports safety? It’s particularly hard someone to get started in safety in today’s economy. I really feel for the one’s trying to find work in this field. First, I tell those people to look for organizations who will invest in them – not just with a decent salary, but will also support them in personal development, conferences, workshops, associations, etc. Second, no one is really interested in how well you know the regulations. Employers are looking for employees who know how to talk to people. So communication skills are important – and I’m not talking about the ability to text or email. Sometimes you have to just pick up the phone and talk with whomever you’re trying to communicate with. Third, I encourage anyone starting in safety to join the American Society of Safety Professionals (ASSP). But it’s not enough to join, it’s important to go to the meetings and network with other safety professionals. I look for people who volunteer for leadership roles in the ASSP. The thing that everyone should know about safety is the thing hardly anyone likes to admit – that ‘safety first’ is the biggest lie in safety. Safety isn’t first or even second. Mike Rowe from the show Dirty Jobs says it’s third, but he’s only partly right. Safety is an inherent property of well-run organizations. Safety shouldn’t be set aside as a necessary evil. Organizational leaders must make Safety a core value in order for it to succeed. I wouldn’t call it a superpower but I think safety professionals need to do more listening than talking. You can’t learn anything if your mouth is always moving. There’s so much that I’d like to see change that it would be impossible to narrow it down to one issue. First, I’d eliminate the OSHA Total Recordable Incident Rate (TRIR) as a means of determining how safe organizations are. The TRIR often forces contractors into the difficult position of choosing between reporting an accident and risk losing a contract, or hiding the injury and keeping a client. There are several other leading indicators that could be used to measure an organizations safety maturity other than the TRIR. Second, I’d eliminate the use of Heinrich’s pyramid to describe accidents in the workplace. Heinrich is known for his book, “Industrial Accident Prevention: A Scientific Approach.” The problem is that his work wasn’t scientific, nor was Heinrich a scientist. Adhering to the Heinrich model can lead to an over-emphasis on worker behavior and not enough attention on systems. Many, including authors Fred Manuele and William Deming, have since refuted Heinrich’s work. Third, disciplinary actions programs have no place in safety. We can’t punish or incentivize our way to safety excellence. I think Sidney Dekker said it best – you can learn and you can blame, but you can’t do both. There has been a pendulum shift over the last few years towards a new view of safety. One person who is leading this charge is Todd Conklin, who has an excellent podcast and book called “Pre-Accident Investigations.” The New View, also known as Safety II or Safety Differently, moves us away from blaming the worker for simply being fallible, but towards the idea that we need to design processes with the assumption that workers will make mistakes. How we learn from those mistakes is the key. This starts with asking better questions when things go wrong. If your safety program is driven by simply asking workers not to make mistakes, then your safety controls are not robust enough.